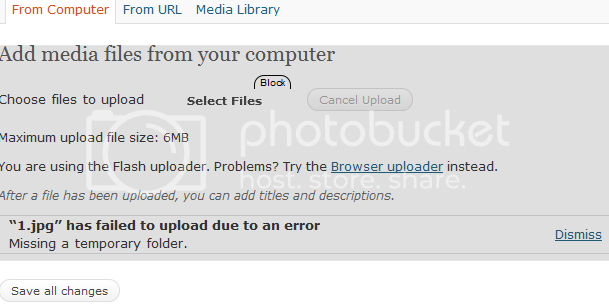 While writing an article using wordpress 3.0's default post writing tool i tried to upload an image to insert in the article but every time i tried to upload image it gives me an error stating 'Temporary folder missing'. Suggest me any possible solutions. thanks! 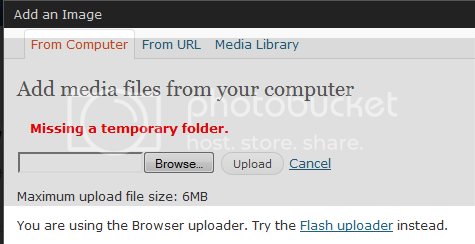 WordPress › Support » Missing a temporary folder ??? I use Windows Live Writter for posting in Word Press very easy to setup it's just like create a Word document. I guess that's a good alternative. I had the same error on TWC last night. thnx for the link. the issue was resolved! WP does have it's moments. A general kick resolves the problem I've found.